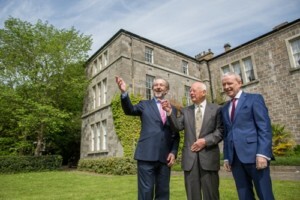 Dublin City University (DCU) has launched a unique programme aimed at engaging the talents and energy of retired or soon-to-retire professionals as they transition to their next stage in life. The Advanced Transitions Programme @ DCU, sponsored by Bank of Ireland, will offer a blend of academic, personal and professional development activities which will enable participants to realise a fulfilled and purposeful later-life by harnessing their extensive knowledge, expertise and experience to benefit society. An initial pilot programme is seeking 25 participants from a variety of backgrounds, expertise and interests who will create a dynamic and challenging community of learners. As part of a week-long introductory ‘Ignite’ programme in September 2016, participants will explore their motivation in undertaking the programme, their current life plans and how these may be achieved and disrupted. The outcome will provide a personalised plan as to how each individual will engage with the range of activities offered in the programme. The programme will draw on DCU’s academic expertise to offer participants access to cutting-edge thinking and developments in areas including enterprise, science and technology, international relations, economics and politics. “According to the Central Statistics Office, there are currently 540,000 people aged 65+ in Ireland, rising to 1.4m, or 22% of the total population, by 2041. “At a national and international level, we must explore ways to respond to the increasing complexity and richness that ageing brings to our societies and economies. “In line with our Age Friendly University ethos, DCU continually seeks to include older adults in all aspects of university life, offering life-enhancing and life-lengthening opportunities. The programme will have core elements alongside optional activities that reflect the particular interests of the group as a whole in addition to each individual’s personal interests. A personal development strand will draw on both academic aspects and consideration of the individual’s life goals, capacities and resources, while the physical, emotional and spiritual health and well-being of the individual are also key to the programme. “Traditional models of retirement are changing as global changes in demographics show that people are living far longer, healthier lives. “The gift of additional decades of life derives from advances in medical science, nutrition, disease eradication and life-styles. This means that governments, universities and individuals need to re-calibrate their thinking and planning if this gift is to be of societal benefit, rather than a perceived burden. “For the individual, the challenge is to remain relevant and to find purpose that leads to continued happiness and fulfilment. Advanced Transitions will also allow participants to use their expertise and talents to address broader societal challenges such as housing, migration or regional development amongst others. Participants will also be encouraged to act as mentors to undergraduate and postgraduate students and to provide advice to student groups engaging with the development of commercial and social enterprises. Participants will be members of the student community in DCU, having access to the wide range of learning and other resources on campus. These include library and online resources, healthy living programmes, sports and gym facilities and the opportunity to interact with University and student-led activities. The full programme, sponsored by Bank of Ireland, will be delivered over a calendar year starting in January 2017. There will be an initial full-time week of activities in January, followed by one or two days of activities each week for two 12-week terms (February-April, and September-December). For further information, contact Ronan King at [email protected].